Pope John Paul II, in his encyclical letter Rich in Mercy states that Mary, the "Mother of Mercy" has the deepest understanding of God's mercy, the one who, more than anyone else, deserved and received mercy. 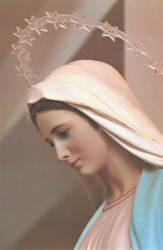 She continues to proclaim His mercy "from generation to generation." (9).